. . . chores become FUN JOBS when you put yourself in the seat of . . . HERE'S ANOTHER POINT TO REMEMBER: Many brands claim they can come close to Simplicity performance. But there's always one little hitch -- and that's HITCHING! Simplicity attachments not only outperform others, they're "ready to go" faster . . . takes less than a minute to change implements without tools. Be sure to compare this important time-saving feature with other brands. You'll agree . . . nobody offers faster hitching. It's another bench-mark of superlative Simplicity engineering. 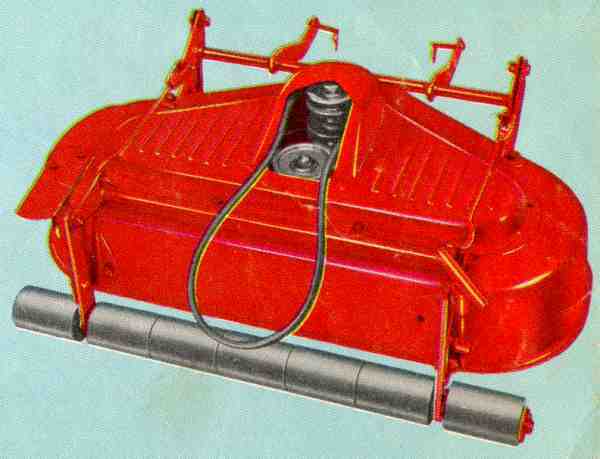 42" ROTARY MOWER -- Hustles through 2 acres per hour. Extra-deep housing, 3 blades and large discharge chute. 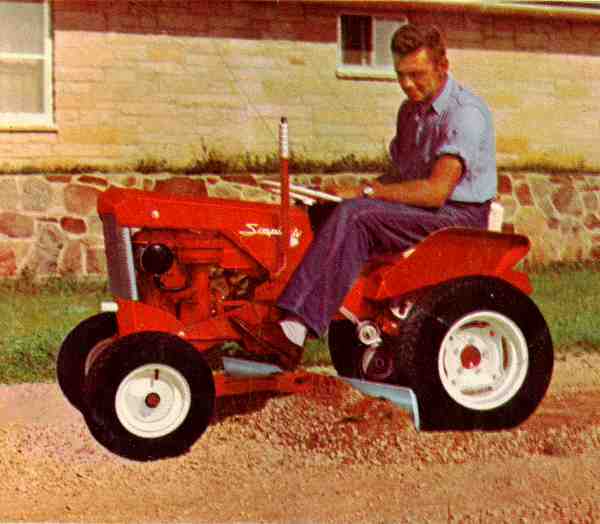 Features exclusive "FREE-FLOATING" -- mower mounted on front axle, so it follows contour of front wheels, never scalps. Cuts to within 5/8" on either side. New, better throwing blades now have added tip life. (Requires No. 211 Power Take-Off.) Model No. 190. Ship. Wt.138 lbs. 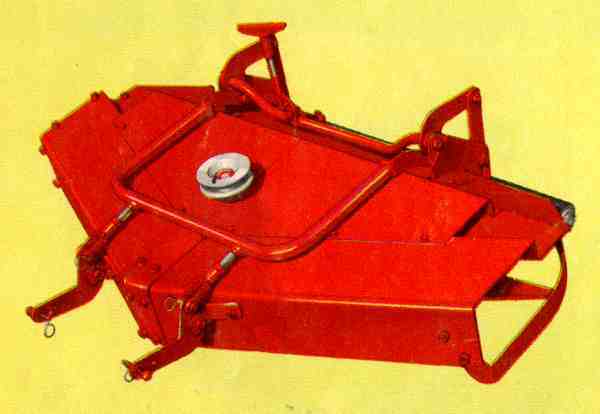 Leaf mulcher No. 226 available as optional equipment. 42" GRADER BLADE -- Maintains gravel drives, levels loose dirt. Attaches with three pins; no tools needed. Angles right, left, or straight ahead, High carbon steel blade is 1/2" thick, double beveled, and reversible. (Recommend four No. 046 wheel weights.) Model No. 237. Ship. Wt. 66 lbs. 32" ROTARY MOWER -- Wades through 1-3/8 acres per hour. Mounts in less than a minute without tools. 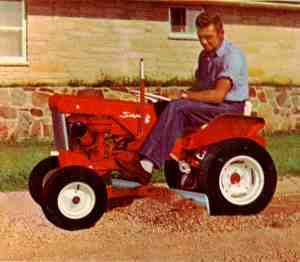 Features Patented "FREE-FLOATING" - -the tractors front wheels tilt the mower over uneven ground. Result: no scalping. 3 High carbon hardened, steel blades and heavy-walled steel housing mean long life. (Requires No. 211 Power Take-Off.) Model No. 207. Ship. Wt. 110lbs. Leaf mulcher No. 173 available as optional equipment.